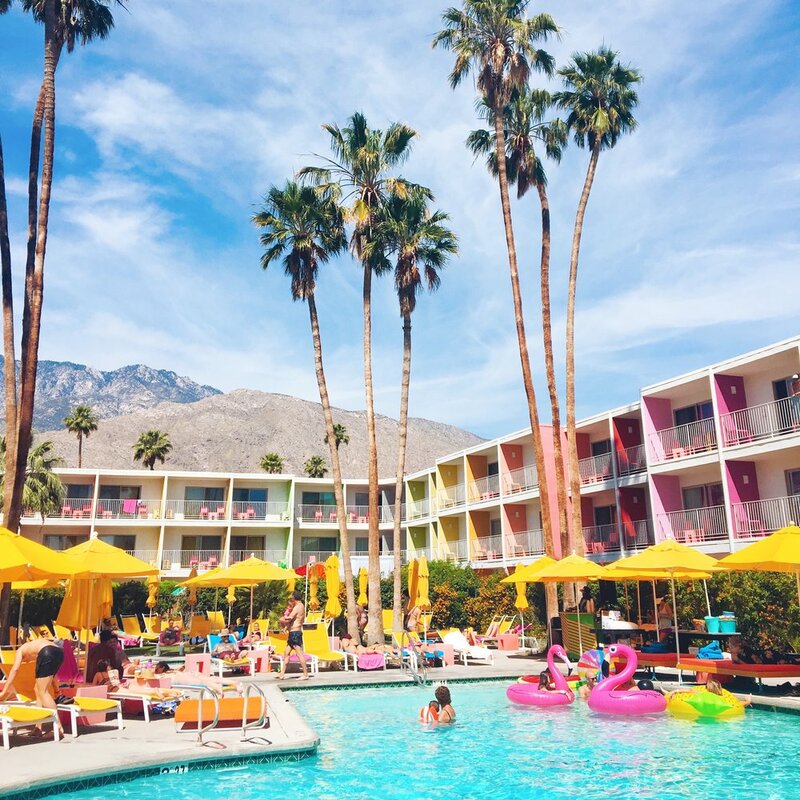 The combination of mid-century wonder, pops of vintage color, and laid back desert vibes made Palm Springs a dream destination of mine. So back when Coachella tickets went on sale for their 2017 festival, I told myself if I wind up getting tickets, we were heading to the desert. (Hint: I got them!) California, here we come! We decided to fly into LAX and drive down to Palm Springs from there, and that decision wound up being one of the coolest parts of our trip. There are so many reasons why California so amazing, but the landscape has to be the best part about it. We drove down highways bordered by mountains and joshua trees, and through the vast windmill alley in the desert, and it was truly so beautiful that it did not feel real. When we finally made it to Palm Springs I will be honest that I was overcome with anxiety – because when I looked down E Palm Canyon drive, the end of the road was literally a MOUNTAIN. 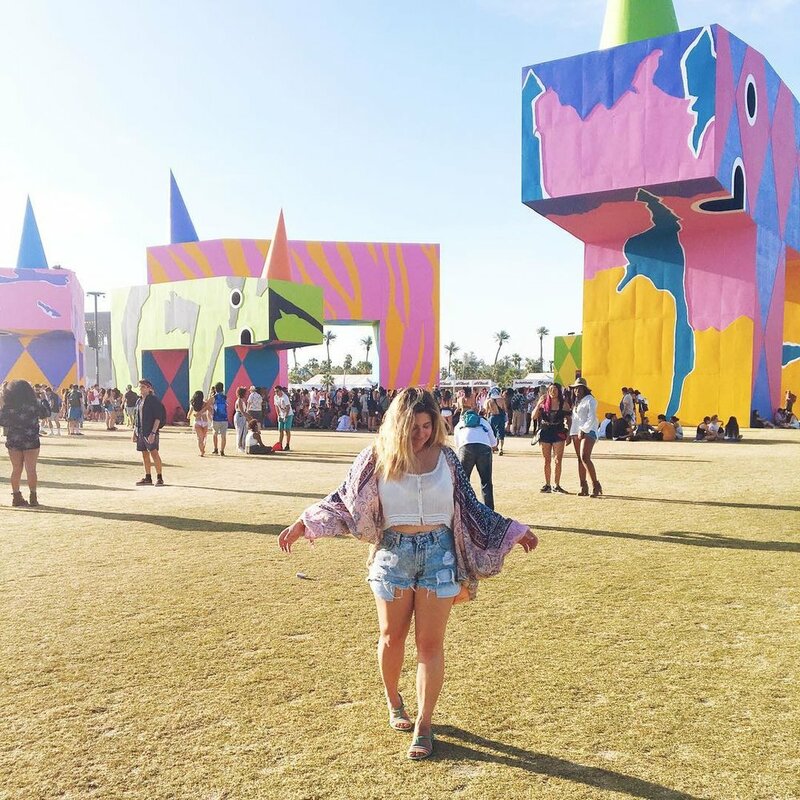 But after I calmed myself down I realized that I was finally in my dream place, and I couldn't wait to spend the next several days exploring and partying at Coachella. Finding an Airbnb during Coachella is a feat 1) because homeowners don't feel comfortable renting to people attending one of the largest music festivals in the world and 2) it is super expensive. Luckily, we found an amazing place with amazing hosts – this Mid Century Oasis at the Ocotillo Lounge in Palm Springs. This place was seriously so thoughtfully decorated, centrally located (on the same street as the Ace Hotel and The Saguaro Hotel), and also had a pool which is a must when staying in Palm Springs, especially during their hotter months. It was also 40 minutes outside of Indio, where the festival is, so it made getting there decently easy. When you stay in Palm Springs, it is important to take in the laid back nature of the town and hang out by the pool for at least some of the day. For all other times, here's what we did! 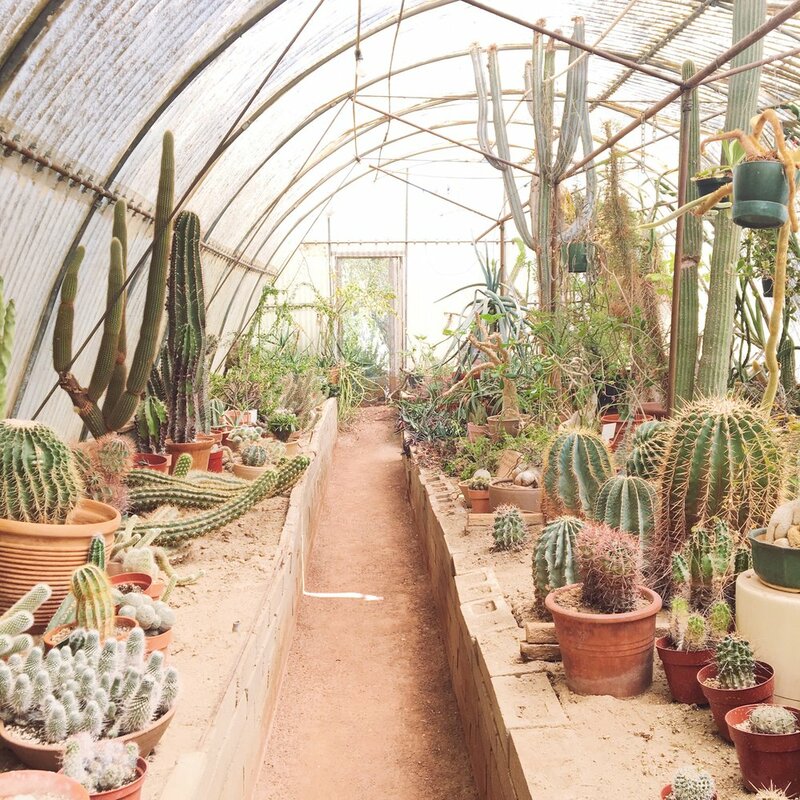 Moorten's Botanical Garden: Moorten's is not your average botanical garden because it's filled with cactuses and aloe vera instead of cherry blossoms and rose gardens, but that doesn't mean it's not just as amazing. There are so many types of cactuses and succulents that it puts anything you find at an East Coast farmer's market to shame. You are free to walk around at your own leisure and stay as long as you want. Make sure to stop in their shop at the end for souvenir planters and cactuses. That Pink Door: It's hard not to find a home decor blogger that hasn't posted a picture of the Instagram-famous That Pink Door. But truth be told, it's only the tip of the iceberg when it comes to the beautiful mid-century architecture that Palm Springs is known for. Do yourself a favor and drive through their neighborhoods and city centers and take the modernism in. Palm Springs feels like a late 60's/early 70's time capsule in the greatest way. Palm Springs Aerial Tramway: The Tramway leads you up to Mt. San Jacinto, a mountain over looking the Chino Valley. You literally traverse via rotating tram through cliffs and wilderness to the very top. And once you're up there you can feel free to hike, grab a bite to eat, or just take in the sights. I'll be honest that I did not take the tramway up – I stayed in the visitor center – because I am horrified of high altitudes. But my boyfriend, Dillon, and brother, Andrew, had the whole tram car waving to me on their way down which made me feel really happy and included, even if I was still on the ground. The Pool at The Saguaro Hotel: When I die, bury me at The Saguaro. This hotel is the most colorful place I have ever seen and truly believe it was made for me to love. The best part is the amazing view of the mountains from the pool. There are also three places to eat in the hotel, so in between swims, grab a bite and a cocktail. 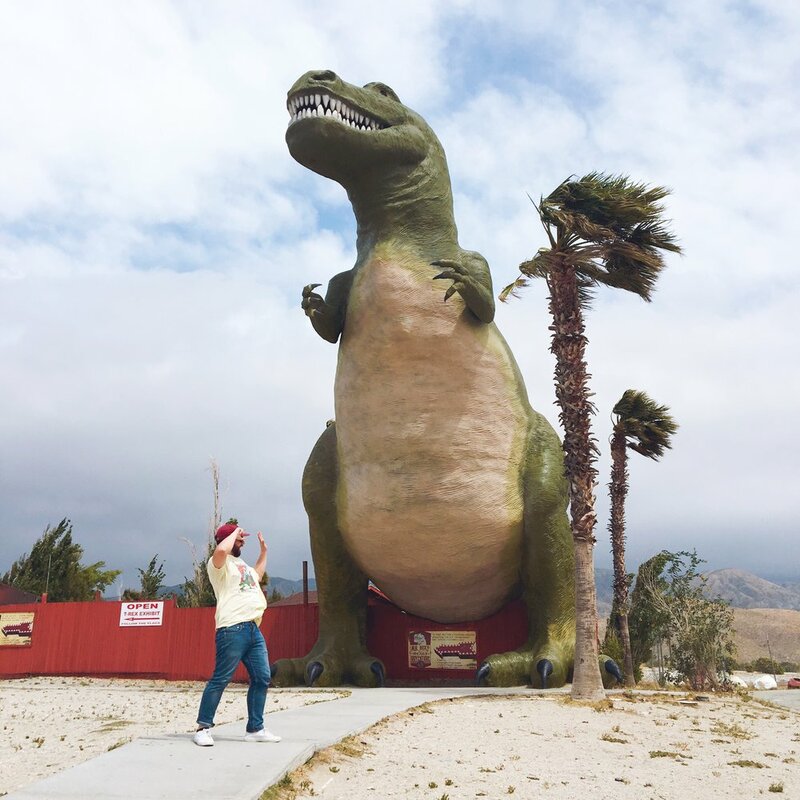 Cabazon Dinosaurs: A good old fashioned – and FREE – American roadside attraction flush with larger than life dinosaurs. 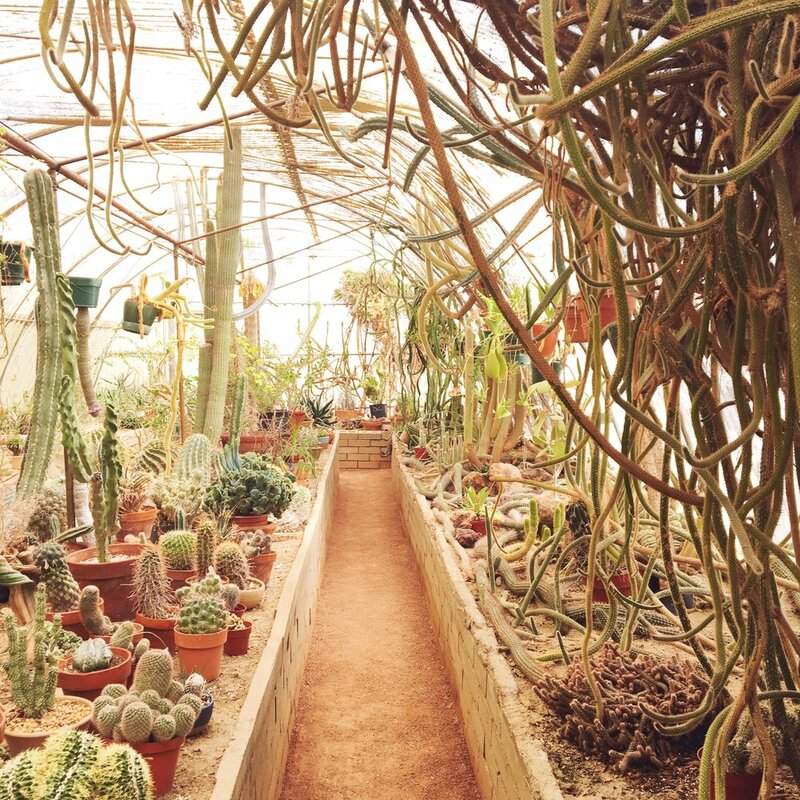 It is technically located in Cabazon, but it is super easy to get to on your way in or out of Palm Springs. I felt like a little kid admiring the attraction, and Dillon and I took turns taking pictures of each other running away from the dinosaurs. You really just can't put a price on childlike wonder. While we were technically staying in Palm Springs for 4 days, a large chunk of that time was spent at the music festival, which limited a lot of our meals in town. However, we did dine at some really cool spots for Brunch that I would recommend to anyone visiting. 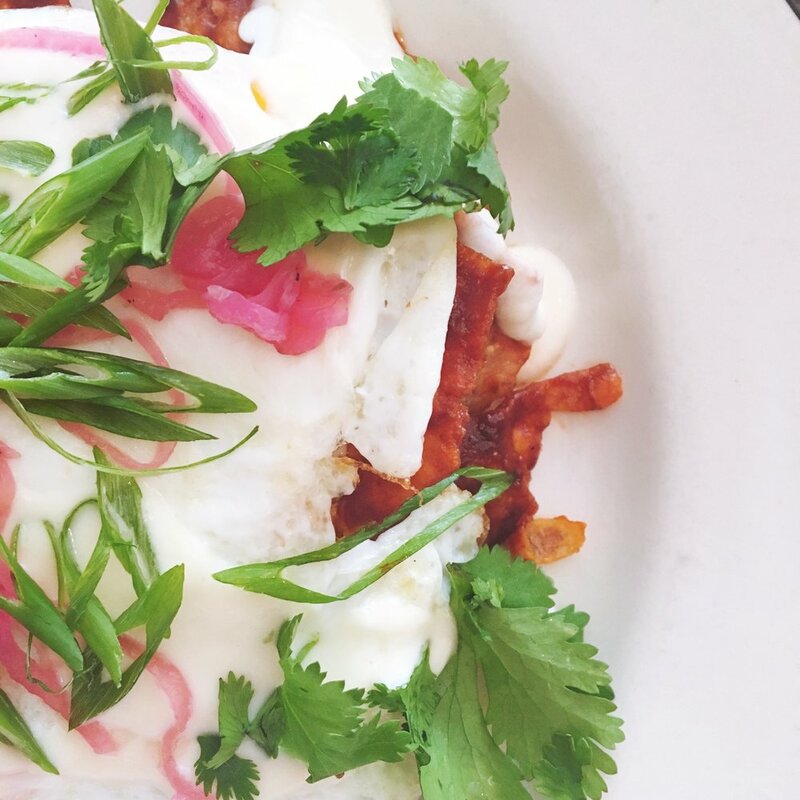 Cheeky's: Cheeky's is the brunch go-to in Palm Springs. Be prepared to wait! Kings Highway: Located at the Ace Hotel, this has great food in with a hip, western vibe. Rocco's: Located at The Saguaro. We enjoyed brunch here before heading over to the pool. I would be remiss if I didn't briefly acknowledge my time spent at Coachella. Coachella was really something, but I will admit that even at age 25, I felt a little old to be there. I attended Bonnaroo back when I was in college, but I didn't realize how washed up and tired four years can make a person. Although I will say that it was amazing and fun, and I totally understand why people choose to go every year. Overall, I am so happy that I got to experience it for myself in flow-y Free people outfits. I can't wait to tell my kids about it one day.